This year's fig season is coming to a close, but they're still out there, and hopefully you can lay your hands on about a pound of them. And quick. 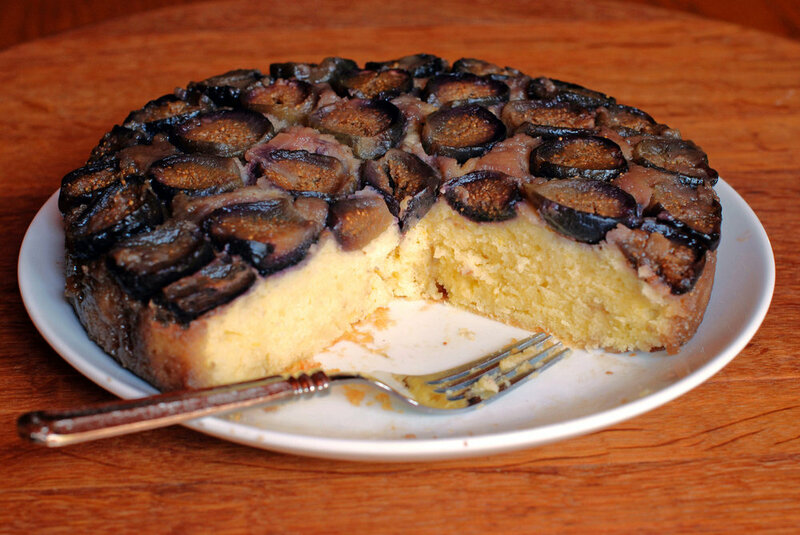 Because if you love figs, you're going to want to get this cake made up in like a real hurry. Oh my ever lovin goodness; simply delicious. The recipe comes from Carla Hall of Top Chef fame, which she shared on The Chew recently. I only made one change to her recipe which I will share with you in a bit. But figs... maybe you've never cooked with figs or maybe you've never actually tasted a fig or maybe you're just not sure about this whole fig thing to begin with, but I assure you, figs are like candy disguised as fruit. Figs and dates... two of nature's truly delectable confections. And because figs are so perfectly perfect, the only thing we're going to do to them is remove their little stem and slice them in half. Aren't figs beautiful? I think it's time to start lobbying for a longer fig season. Two months just doesn't cut it. But to make this extraordinary cake, you're going to start by melting some butter and brown sugar in a pan. This is where Ms. Hall added orange juice and lemon juice to the pan and where I added Bourbon. I'm sure this does not need explaining. Once you've got your butter, sugar and Bourbon all melted and perfectly combined, that gets poured into a cake pan to sit while you slice your figs. Then your figs get placed onto the sauce really tightly together so everyone gets real chummy in there. By now you've got your cake batter all made so you're going to spoon that over the figs very gently so the figs don't get moved around too very much. In a small saucepan over medium heat, melt 3 tablespoons of butter. Add the brown sugar and the Bourbon and stir until everything is dissolved, about 2-3 minutes. Scrape this mixture into the bottom of the prepared pan. 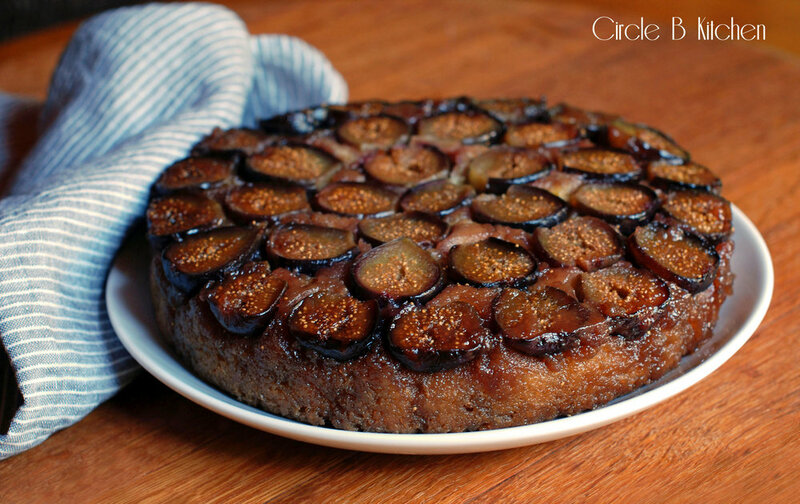 Arrange the cut figs flesh-side down very close together in an even layer on top of the brown sugar mixture in a circular pattern. In a large bowl, whisk together the lemon zest, flour, baking powder and salt. In a separate bowl, cream together the 2 sticks of butter with the granulated sugar. Beat in the eggs, one at a time, then beat in the sour cream and vanilla. Then, stir the dry mixture into the wet mixture with a wooden spoon. Using a large spoon, carefully dollop the batter over the figs in the cake pan. Transfer to the oven and bake until the cake is golden brown and a toothpick inserted into the center comes out clean, about 40 minutes. Let rest in the cake pan for about 10 minutes. Then run a knife around the edges and invert the cake onto a platter. Cool completely before serving. Serve with a dollop of whipped cream and a sprinkle of powdered sugar (totally optional and unnecessary, in my humble opinion).